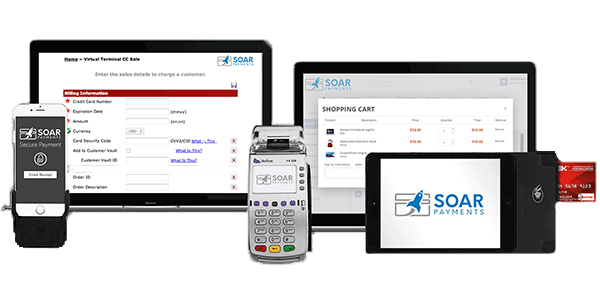 SoarPay is the #1 merchant account for FFLs, gun shops, and businesses in the firearms industry. SoarPay Is The #1 Choice For Firearms Merchant Services. Most credit card processors do not work with firearms merchants, for two reasons: First, the sale of firearms is regulated by the federal government and therefore requires additional underwriting by the credit card processor. Second, because firearms are a “political” issue, many merchant service providers and their sponsor banks decided to take an anti-Second Amendment stance, and refuse to serve fully legitimate firearms-related businesses. Soar Payments, by contrast, has been proud to serve the firearms industry since our company began. We have developed extensive relationships with gun friendly credit card processors and FFL friendly banks, so we can confidently and sustainably support firearms merchants. Consequently, we remain ideally positioned to offer low price, stable firearms payment processing — without the interruptions, payout freezes, and unfair terminations that businesses have seen at PayPal, Stripe, or Square. Elliott Firearms Software, Gun StoreMaster, Rapid Gun Systems, AIMsi, Epicor FFL Compliance Manager, Firearms Management Systems, and GunBroker. 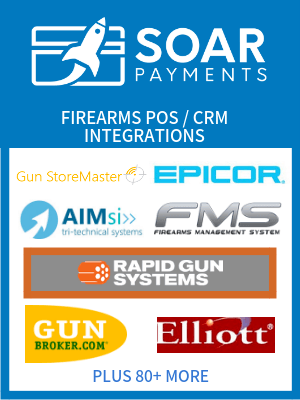 Soar Payment’s firearms merchant accounts can be integrated with most other software or CRM platforms which are compatible with the Authorize.net, NMI, or USAePay payment gateways. A retail firearms merchant account enables businesses to accept face-to-face credit and debit card transactions from a traditional credit card terminal, wireless, or point of sale system. Retail firearms merchant accounts are ideal in a retail setting with reliable wired internet connections. Examples include gun ranges, gun stores, concealed carry training centers, outdoors and hardware stores. 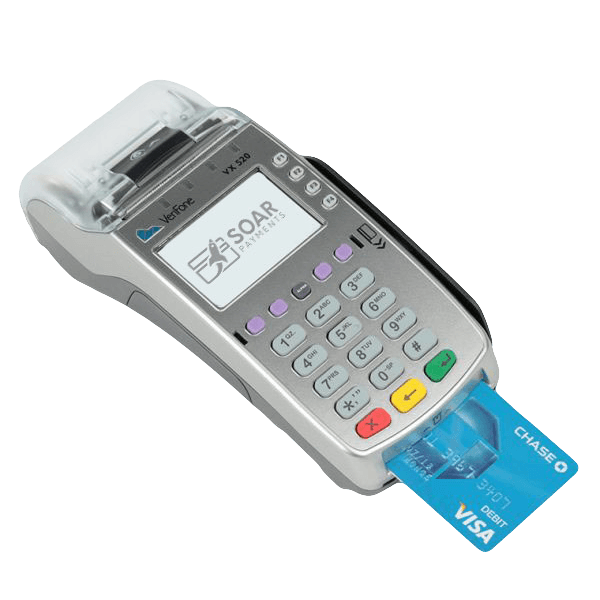 The cost for retail credit card processing is typically lower than for similar eCommerce-based businesses. A mobile firearms merchant account enables businesses to accept credit and debit card payments via an attachment that plugs into their cell phone or iPad. Included with an account is a credit card swiper that plugs into your Apple or Android tablet, iPad, or mobile phone. Most appropriate for businesses who sell face-to-face outside of a traditional storefront, such as FFLs who set up at a gun show, mobile firearms credit card processing typically costs less than than eCommerce processing. Also referred to as a payment gateway merchant account, businesses can accept payments over the phone, via mail order, or typed into a regular computer (without outside equipment). A firearms payment gateway is ideal for accepting credit card payments over the phone, or taking payments without outside equipment. 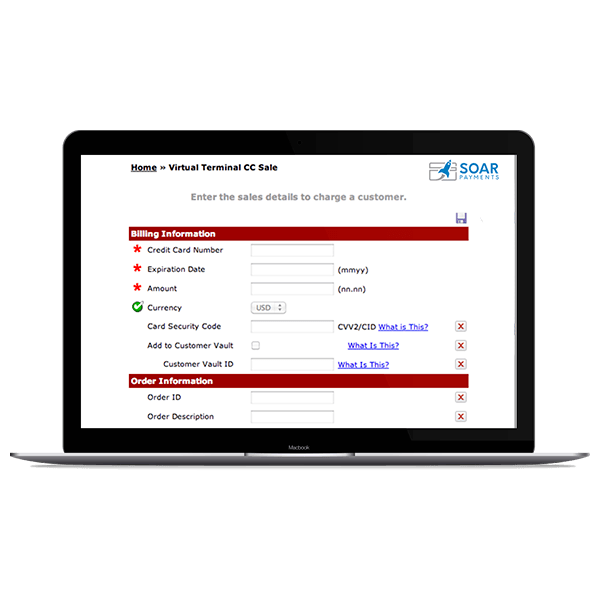 As payment gateway processing can often be more vulnerable to customer fraud and chargebacks, Soar Payments provides integrated chargeback protection technology. Selling firearms, ammunition, or firearms accessories online? You’ll need an eCommerce merchant account with an integrated payment gateway. FFLs, gun accessory manufacturers or other firearms businesses who sell online, will need a merchant account specifically approved for eCommerce. 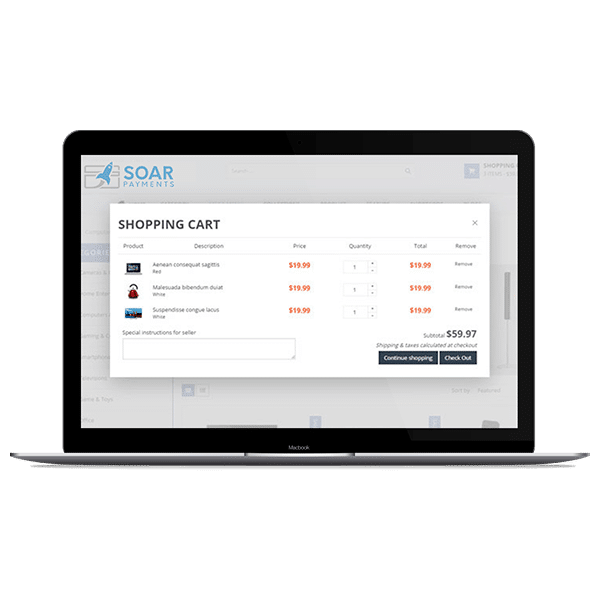 eCommerce firearms businesses are more vulnerable to customer fraud and chargebacks; as such, Soar Payments provides them with integrated chargeback avoidance technology. What types of firearms industry businesses do you accept? 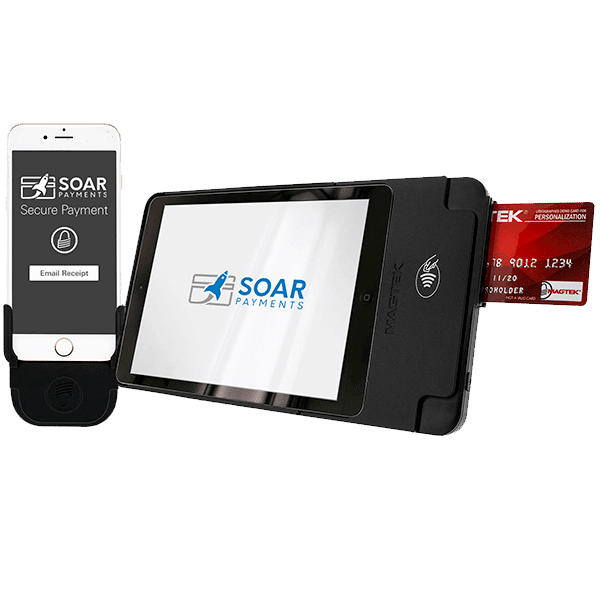 Soar Payments accepts a wide range of retail, eCommerce and mobile-based businesses related to weapons and firearms. These include ammunition, firearms, gun components, and gun accessories (e.g. holsters and scopes) manufacturers, distributors, licensed vendors and resellers. Additionally, we accept military and tactical related businesses, non-firearm weapons sales (such as knives, swords, archery, etc.) And finally, we service a wide range of firearms related services and storefronts, such as target shooting ranges, concealed carry training services, gun clubs, and gun shops. Is Soar Payments compatible with my existing firearms inventory and/or Point Of Sale (POS) software? ​Do I need an FFL to get a firearms merchant account? You do not need a valid FFL to apply for a firearms merchant account to sell non-firearms products (e.g. accessories or holsters). However, to be approved to sell firearms you will need a valid FFL. You may apply for a merchant account while your FFL application is pending, however you won’t be able to be approved or start accepting credit card payments until the FFL is provided to your credit card processor. 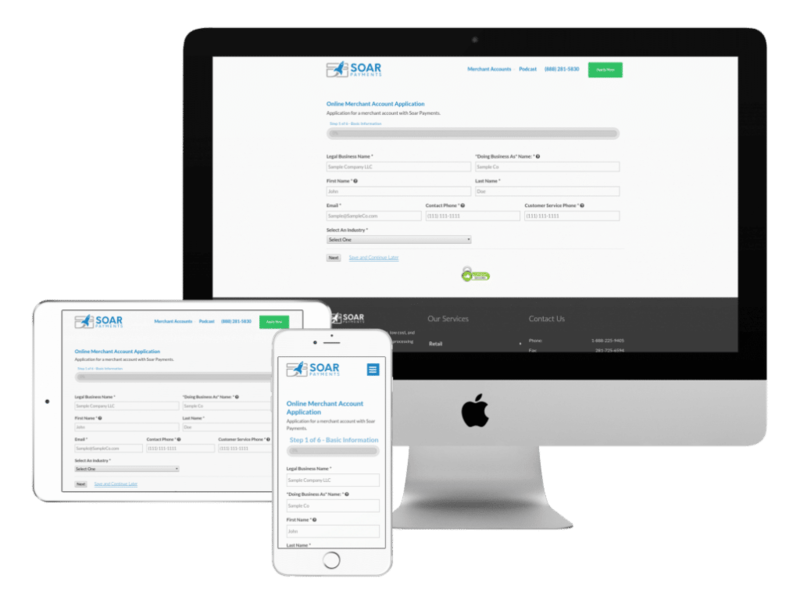 ​What criteria does my firearms business need to meet, to be approved for a merchant account by Soar Payments? To be approved, your business: must have FFL if selling firearms; must not sell all accessories needed to assemble a gun if business does not have FFL.